Due to water-logging of their Oxen Lane home Cliffe FC reversed there fixture this week and made the short journey to Selby to face Selby Olympia. On a tight, boggy pitch Cliffe started very slowly, looking in no hurry to adapt to the surface even when the hosts took the lead on 10 minutes with a stunning drive into the roof of the net this did little to kickstart Cliffe. A guilt edged opportunity presented itself when Ben Rawson was needlessly fouled in the area, a push in the back at a throw in, and David Evans duly took the chance, slamming the resulting penalty home. Cliffe lost Neil Taylor to injury but not before he had set up Andy Addison to put Cliffe in front, a neat pull back from the touchline fired in from 10 yards. Some clever football from Cliffe provided a couple of chances before the interval but good goalkeeping and stout defending kept the visitors at bay. The second half saw Cliffe run riot as the Olympia team seemed to tire then almost give in. 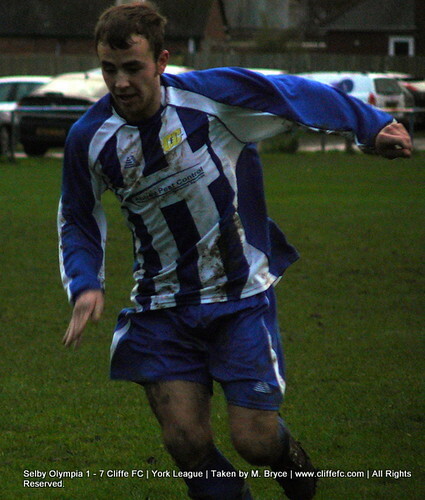 Tom Hogg, on for the injured Taylor, added the third firing past the keeper in a one on one. Ben Rawson scored the fourth with a downward header from a corner that squirmed under the keeper and Hoggs persistence lead to an unfortunate defender putting through his own goal for the fifth. Olympia rallied briefly and Ally Harris was forced into action in the Cliffe goal but the revival was short lived as Andy Addison added his second and Cliffe’s sixth. The final ten minutes were real “backs to the wall” stuff for Olympia with last ditch defending and good goalkeeping preventing Cliffe running up a cricket score. Scott Birch and Addison keeping Olympia pinned in their own half created chance after chance with Billy Atton, Paul Fenton and Steve Wilcockson all going close but Hogg was not to be denied his second as he rounded the keeper and slotted home from a tight angle to make it 7-1. There was still time for more drama as Evans had a second penalty saved and another strong penalty appeal was turned down! Once again Cliffe had been slow out of the blocks but once they got going they had proved too strong for their hosts, results in other games saw Cliffe move into second place on goal difference and next week Strensall are the visitors to Cliffe in a top of the table clash.